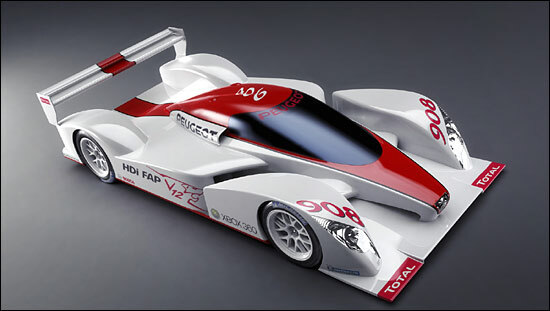 The drip drip ‘reveal’ for the Peugeot 908 prototype racer continued today with the unveiling by Peugeot’s Managing Director Frédéric Saint Geours, at the Paris Motor Show, of a full scale mock-up of the HDI diesel engined-car which will contest the full 2007 Le Mans Series and, of course, will mark the return of a factory Peugeot team at Le Mans for the first time since their last win in 1993. The 908 had long been rumoured to be a closed coupe and indeed the first images show that the Peugeot will be the first GTP spec car since the 2003 race winning Bentley. 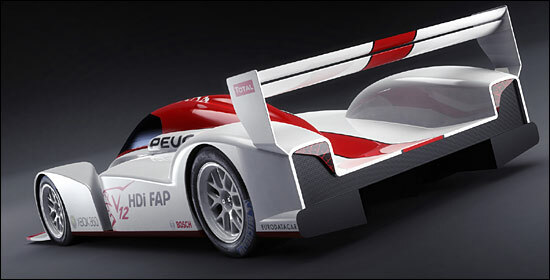 Peugeot’s choice to campaign a closed car marks a desire within the company to maintain a visual link with the two-times Le Mans 24 Hour winning Peugeot 905. 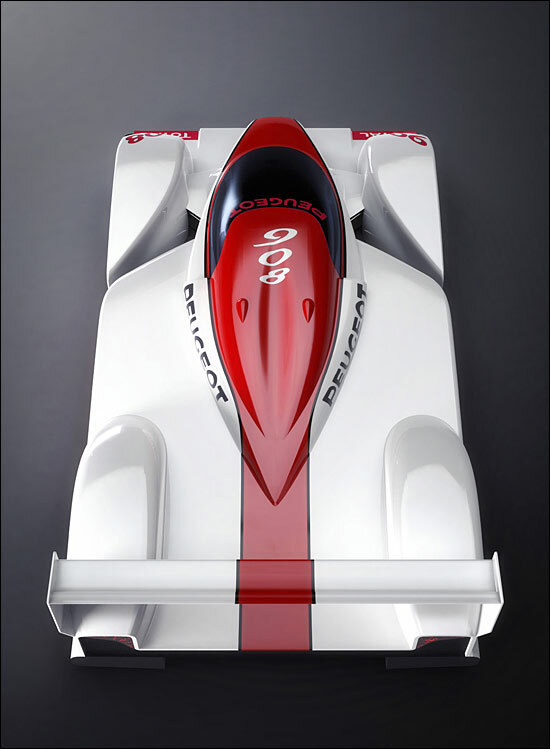 The 908 though is a carbon monocoqued closed structure, unlike the 905 which was constructed with a detachable tubular rollover bar. 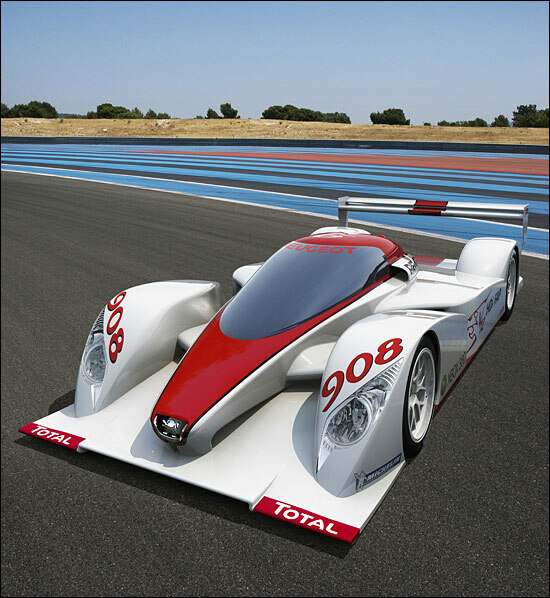 Peugeot say that the 908’s layout presents both a number of drawbacks (weight, height of the centre of gravity, operational problems) and some advantages, particularly in terms of chassis rigidity and aerodynamics. Peugeot has also announced an impressive list of sponsors for the Le Mans Series programme with Total, Michelin, Bosch, Eurodatacar, and Xbox all already signed as commercial partners. The engine is at the maximum capacity permitted by the regulations and was chosen thanks to its greater internal airflow at low engine speeds. It also gives potential future development opportunities to use different grade fuels. The choice of a twelve cylinder engine helps keep the cylinder bore diameter very close to that of a production series engine. In doing so, Peugeot can call on its extensive knowledge of diesel combustion and also ensure the engine has a reasonable piston stroke. The V12 architecture, well known for its good balance, also reduces vibrations to a minimum. The 100° V angle, like the V12 architecture, makes it possible to lower the height of the centre of gravity without affecting the engine’s torsional rigidity. guarantee “smoke-free” operation of the engine under all conditions. The two exhaust systems are as short as possible. On each side a 6 into 1 exhaust manifold is connected to a Garrett turbocharger, then to a very compact diesel particulate filter before ending in a side exhaust pipe, located in front of the rear wheel. If the finished article matches up to the mock-up shown today, the Le Mans Series, and the 24 Hours itself, will host a new and beautiful addition to the grid in 2007.